The most carefully set protection is pointless unless the circuit breaker operating times are established. Even the most carefully planned discrimination can fail due to the poor operation of circuit breakers. Our experience shows that many older circuit breakers far exceed their stated opening times and in extreme cases we have found circuit breakers operating in excess of twice the stated opening times. O'Hara Engineering use PME-500-TR is an extraordinary forward step in the concept of circuit breaker test equipment, due to its simple and easy control method. The equipment saves time and improves testing productivity. Simultaneous measurement for the 3 main contacts (open/closed) and 2 auxiliary contacts, including pre-insertion resistors (if present in the circuit breaker). Evaluates the synchronism between the circuit breaker poles. Determines the maximum currents, opening and closing times, simultaneously in both coils. Evaluates the state of the substation’s auxiliary batteries by graphically showing the coil consumption. Immediately displays and prints test results, both numerically and graphically. Automatically calculates the contact resistance in the three chambers. Travel, speed & acceleration analysis with the optional PME-TCE plug-in module. 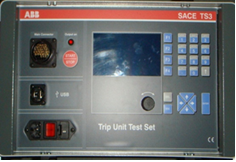 O'Hara Engineering use the ABB TS3 Trip Test Set is a test device which performs functionality tests on ABB SACE Low Voltage Electronic Trip units. Tests have to be realised with the circuit breaker out of service, in a safety condition with the trip unit removed. The device is operated with microprocessor digital technology and it utilizes the on board LCD Screen and Membrane Keyboard. This device allows full diagnostics of the circuit breakers that it connects to including Auto protection testing, Alarm test, Timing tests, operation parameters and settings. This device also allows us to look at the operation of the breaker i.e. number of operations/trips etc. To our knowledge this is the only ABB TS3 test kit in Ireland. The measurement of the main contact resistance of circuit breakers gives reliable information on the condition of such devices particularly after clearing a major fault .The measurement of contact resistance at commissioning stage for fingerprinting purposes gives valuable information for monitoring the device during service. To carry out these measurements we use highly accurate micro-OHM meters. 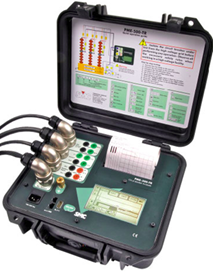 O'Hara Engineering Services also carries a number of manufacturer driven propriety circuit breaker test set. Please contact the number below for more details.